Company: Can be kept in a community aquarium with other calm species that are to big to fit in their mouths. The Clown loach should always be kept in schools. They do not do well if kept alone. Aquarium setup: Use sand or gravel as bottom substrate since it allows the clown loaches to dig. Decorated the aquarium using roots and rocks and PVC pipes etc to create a lot of hiding places. 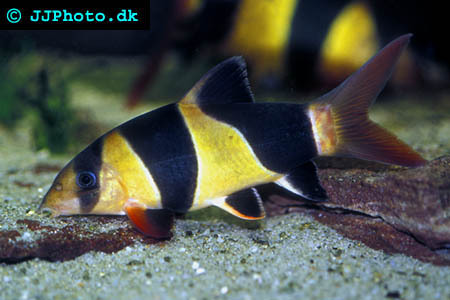 For younger clown loaches plants are also recommended to create hiding places older clown loaches will however destroy most plants. There are a few plants that can be kept with adult clowns such as java ferns. Use floating plants to dim the lighting. Feeding: Will accept all kinds of sinking food. 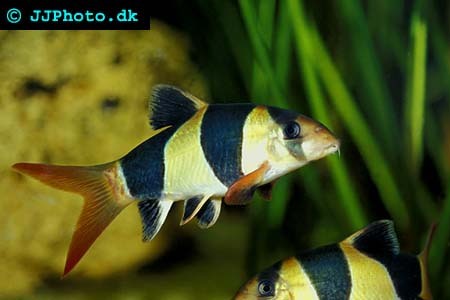 Some clown loaches also learn to get food on the surface swimming upside down..